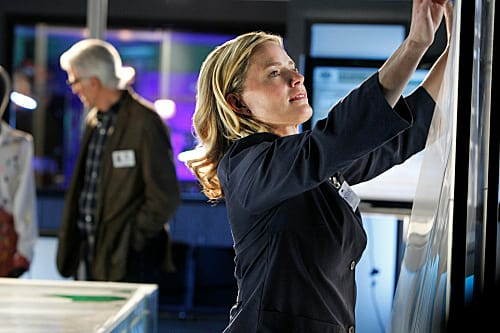 CSI First Look: Welcome, Elisabeth Shue! Goodbye, Catherine Willows. Hello, Julie Finlay! With Marg Helgenberger having bid farewell to CSI this week, it won't take too long for the CBS drama to replace this key member of the team: Elisabeth Shue will make her debut as Finlay on the February 15 installment, "Seeing Red." "Elisabeth's character will share a past, in another crime lab, with [D.B. Russell]," Don McGill, executive producer, said in a statement. "The first time things didn't go so well between the two of them. Maybe the second time's the charm, or not." Jim G. is a TV Fanatic Staff Writer. Follow him on Twitter.